Sharon Arnold curates beautiful galleries, from the big, traditional versions, to the small, transportable ones. 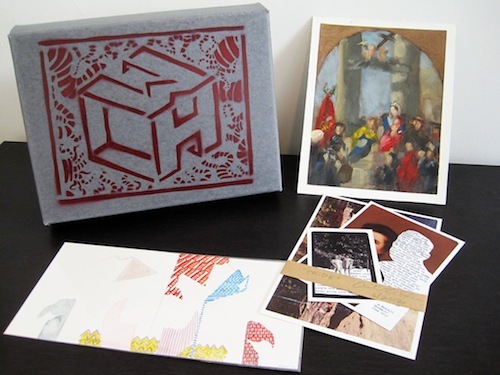 Her series LxWxH features a box containing visual art work and paired written work and is super fun and cute! We had a chance to chat with Sharon about her series as well as her new gallery. Enjoy! Jake Uitti: You’ve been putting out LxWxH – a tangible collection of art paired with a written work – and you recently began curating a gallery. Can you explain how one led to the other and the differences in the responsibilities? Sharon Arnold: I started the LxWxH Subscription Project at the beginning of 2011, after trying something similar (and failing, ha!) in 2007/8. I wanted to find a way to make art collecting easier for people who either didn’t have space, funds, or experience. I figured I could make something that seems really intimidating – walking into a gallery to look at and potentially purchase art – much more intimate and accessible. I also noticed I wasn’t as connected to the writing community as I would have liked, and that was interesting. Historically these two communities are fully engaged with each other and I wanted to bring that to the project, too. So I started putting them together and the results have been really inspiring! What started out as an experiment to combat a depressing era of gallery closures, ended up as a real project with legs and I realized that not only did I wish I could work with more artists, I wished I had walls. I’d been independently curating already, and after 3 or 4 shows in 2012 I realized this was something I could do full time. I told Kirsten Anderson I wanted to open a gallery and without hesitation she told me to do it, and became my silent partner. So when a space opened up in Georgetown, I jumped at the chance. Now I feel the two platforms connect to each other seamlessly – the subscription project ends up serving as a variation of a flat file project, which is something many galleries have to provide more affordable works for their patrons; but in a way that allows artists to really experiment and play. I still look at it as art collecting step 1, with the idea that it leads to step 2, step 3, and beyond. The gallery serves as an extension and expansion of that platform. The responsibilities are the same: largely, organizational. What I love about what I do is putting things and people together in a thoughtful way – I ask the question “why?” a lot, of myself and my choices. I take a pleasure in this kind of puzzle-piece-assembly. I regard my job as something of a caretaker and nurturer. I want to be encouraging of artists and writers to take risks and push beyond what they know. I want to push the boundaries of what I know. JU: What is it that excites you about the ‘puzzle pieces’ project, about putting people and things together? What’s the biggest surprise success and maybe example of failure this has exposed you to? SA: The thrill in these puzzles is finding ways to expose the correlations between people or work in a way that makes sense, and reveal them to viewers. I like to bring submerged things to the surface, or tease out the parallels that even I haven’t been able to articulate but know are there. When I’m hanging a show I like to pull the narrative forward even more, in a way that unfolds as you walk around the room. This is how it always works, from the smallest scale to the greatest. It’s about storytelling. In success, perhaps the best (and biggest!) example is Red Current at Roq la Rue Gallery in March 2012. I curated nearly 40 artists, all whom I chose very carefully, to be in one giant Salon-style show. It was like a musical piece coming together – all this lush forestry, alchemy, and animal narrative came out in ways that I could never have anticipated, though I must have seen it there. After all, I curated it. I often don’t know if this serendipity is a result of something I’m unconsciously thinking about, or if I’m picking up on something that artists are collectively thinking about; but more often than not this very thing is what happens when I put together a concept in a show. Whether it’s two people or forty, connections ultimately emerge. It can’t be forced, but when you allow it to happen, it does. I’ve found that in failure, sometimes the writer (in the subscription project) can make the correlations I see a little more obvious to others. Or it doesn’t. But fortunately that’s only happened once or twice, where a connection didn’t make sense. I try not to over think it. Not everything can come together a magically in life as it does in your head! JU: What do the terms length, width and height mean to you now? SA: It’s funny – there’s an urge to correct the term (from others, sometimes) to an industry standard description of dimensional works, which is height first, then width and length. It’s because galleries, museums, and art texts all use that format. But when I came up with the title I wasn’t interested in that. I was interested in something that was about understanding an object in space. The layman’s term for that is “lxwxh” and so I chose it. It’s also the formula for measuring the volume of a cube. I loved how that corresponds with the metaphorical idea that there is this volume of art in the world, and that you fill a space with it. The equation “a³” (a to the power of 3) would have been an awesomely nerdy gallery name – and I did consider it! – but not exactly approachable. I think people understand that a gallery is a cube and they get the title’s meaning, and that it’s sort of fun. It’s fun for me, at least! Ultimately, dimensions are variable. They can be anything. They can be any size, and any shape. They can represent any idea. It goes on forever. JU: What’s next for LxWxH? What’s next for the gallery? SA: I have some exciting curatorial collaborations coming up in 2014, and a couple of really fun group show ideas – but expect to see a lot of solo exhibitions in the next year. The Subscription Project will undergo a few changes as well, but won’t disappear – it’s a fluid project meant to create flexibility for people interested in buying art. And events!! Symposiums, screenings, dinners, and workshops are all on the books for the coming year. I’ve always envisioned the gallery as an activated space, not a static one. I want to bring people in on a wide range of topics and ideas that are related to art in some way, even if they aren’t specifically about art. A gallery space should be participatory – that’s the point, after all: art builds community.